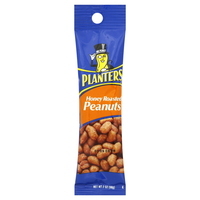 Planters Honey Roasted Peanuts are peanuts that have been salted and roasted with honey. If you’re going to buy peanuts, you might as well buy Planters. And if you’re buying peanuts from Planters, you might as well get the Honey Roasted ones. They taste the best. You get the delectable combination of sweet and salty with a nice solid crunch. You will get a little residue on your hands, but you can get rid of that with a napkin or wiping your hands on your jeans. Planters is a good brand because their peanuts are consistent. You can tell the difference between Planters and generic brands. Generic brand peanuts are often misshapen or off tasting. Planters Honey Roasted Peanuts are a little more expensive, but it’s worth it for the quality.